Australia eventually ran out comfortable victors against the United States Eagles, but Michael Cheika's experimental Wallabies side failed to make a Rugby World Cup statement with their error-strewn performance at Soldier Field in Chicago. The Wallabies not for the first time this season were guilty of playing laterally without first getting across the gain line for much of the first half; they lacked fluency under pressure at and behind the gain line, and only in the second stanza, when they stepped up the pace and intensity of their work at the breakdown, did they come close to delivering the scoreline predicted before the match. 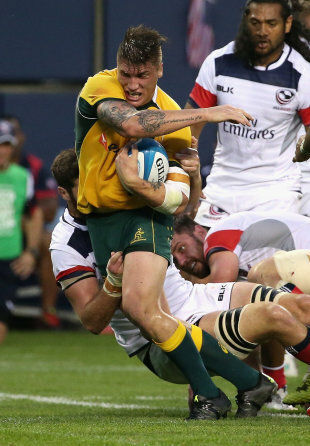 Australia started well, dominating the opening quarter on the back of a strong effort from the pack, the forwards winning lineouts with ease and driving the Eagles back in three consecutive scrums, and they led 14-0 inside 18 minutes through tries from halves partners Bernard Foley and Nick Phipps. 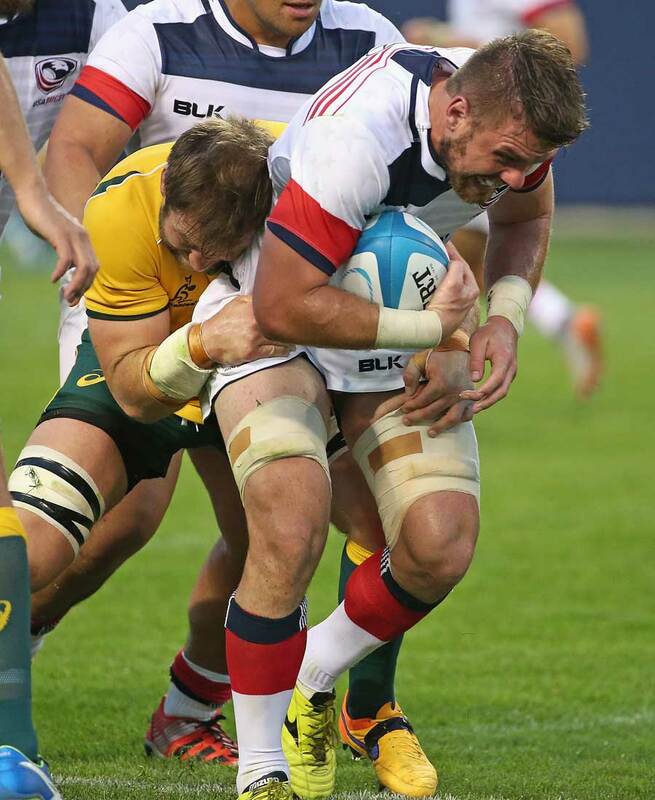 Foley opened the scoring after when he stepped inside the cover defence to touch down under the posts, the try posted after a pack drive in the phase immediately after the Eagles' Australian lock, Greg Peterson, had been sin-binned for the hosts' repeated infringements. The fly-half converted and then played a key role in doubling the tourists' advantage when he broke on the near side after collecting a dropout, feeding James Slipper who popped a pass for Phipps to ice the movement. Much as the Wallabies at this point looked set to coast home, they dropped their intensity and started to drop ball and make mistakes. The United States reduced the margin when AJ MacGinty kicked a penalty five minutes after Phipps' try, the goal reward for a period of pressure in which the fly-half had featured prominently with two half-breaks, and the home fans in the 23,212-strong crowd - the second-largest rugby crowd in history in the USA, after the sold-out All Blacks Test at Soldier Field 10 months ago - went into raptures when MacGinty's partner in the halves, Mike Petri, crossed after a break instigated with a steal from Eric Fry that featured pace and a dazzling step inside Rob Horne by Takudzwa Ngwenya. Australia were more direct in the second half, and their handling, with more time and space, improved with Will Genia, on for Phipps, directing traffic; they settled and Sean McMahon posted his first Test points in a lineout drive after the Eagles had been penalised for offside. Dean Mumm, on for Rob Simmons, bagged his second Test try from another drive before the Eagles went within metres of scoring after skipper Chris Wyles swept on a loose pass and charged downfield only to be chased down by Joe Tomane. The play broke down but the Eagles were awarded a penalty a few phases later only to lose the opportunity after they overthrew a five-metre lineout: the Wallabies charged downfield through Henry Speight, who then found Tomane and McMahon, who set Kurtley Beale on his way to the left corner. The Eagles now were dispirited while the Wallabies, tails up, were slick, and Quade Cooper, after a bust from Tomane, and Taqele Naiyaravoro, after slick hands in the backs from a lineout on the opposite flank, crossed in the same corner. Foley, who has endured his kicking difficulties from the tee this season, landed six of his seven conversion attempts.